Soon, we will publish an on-demand video version of the Spanish Classes, as taught at The Spanish Class Cafe. This ebook, The Spanish Book, will be an excellent compliment to the on-demand video classes. 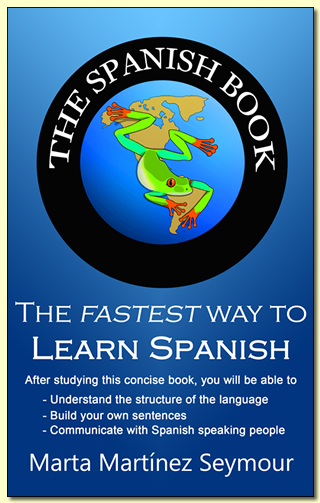 You can now order your ebook version of the textbook "The Spanish Book". The Spanish Book is a much bigger version of the textbook for the classroom "The Spanish Book for The Spanish Class Cafe". I incorporated into the content of my book the answers to the main questions that the students have had during all my years teaching classes at North Seattle Community College and at my school, The Spanish Class Cafe. I also included more exercises and all of the answers to the exercises. Are you ready to learn Spanish? The Spanish Book with The Spanish Class System™ is the answer. It is a simple and concise method that will help you learn Spanish faster. Be in control. You decide what you want to say. We give you the tools.You will understand the structure of the Spanish language so that you will be able to create your own sentences. Using prefabricated sentences, as taught by most other Spanish courses, slows down the process. The Spanish Class System™ will empower you to understand what you are doing from your very first class. I hope that you will enjoy The Spanish Book and method and find yourself learning Spanish as my students have for many years. Be sure to practice the lessons and speak Spanish as often as you can. Listen to Spanish music, read aloud, and watch Spanish television to train your ear. Soon, you will find yourself learning Spanish faster than you ever thought possible.